Stuck on an app idea that is not a cheese plate or veggies and hummus? Look at these cute little guys! So cute. I much prefer to entertain outside than in (I think we've sat at our dining table maybe twice? ), so we've been inviting friends to join us for dinner more often. The appetizer is not the part of the meal I wish to put effort towards, and these little numbers take all of 10 minutes to put together and can totally be prepped ahead and dressed last minute. If you don't find yourself needing tiny things on a skewer, I put the extra bits of watermelon and cucumber over some arugula, add some salmon, the following feta vinaigrette and wa lah, dinner. I recently worked with 31 Bits on a shoot featuring some of their new kitchen line. I've been using the indigo plant-dyed napkins for summer dinners and a handful of other pretty items are up on their homepage at the moment. You can read more on their company on the about page, but the they're pretty awesome as a whole. A few local girls run it and their mission is to bring more job opportunities and fair wages to artisans all over the world. Anyway, we're doing a giveaway over here Wednesday through Friday if you want to participate. The skewers shown are available at World Market or here. In a small mixing bowl, combine the shallot, oregano, half of the mint, vinegar, oil and a pinch of salt and pepper. Give it all a stir. Crumble in the feta and give it another stir, a few chunks are ok. Shave the cucumbers into strands with a vegetable peeler, lengthwise. Assemble them on the skewer by putting a cube of watermelong, folding a slice of cucumber like an accordion, and then another cube of watermelon on top. Arrange them on your serving tray and drizzle the feta vinaigrette over the top. Garnish with a sprinkle of fresh mint, a grind of fresh pepper and serve. This is likely not the first time, nor will it be the last, you'll hear praises for Melissa's cookbook, The Minimalist Kitchen, in the food blogsphere. Over the last few years, Melissa has pared down her kitchen and cooking to focus her work on a "less is more" approach to food. It is concise and reasonable. Delicious by way of straight forward techniques. This recipe for example. I usually roast our cauliflower straight from florets, but the pre-steam made such a difference in their texture, more tender and gentle. I like them both ways. It's little things like that. I believe there are a few kinds of cookbook consumers; this book is for the person looking for quick, weeknight, crowd-pleasers made from ingredients you likely have in your pantry, or will have no trouble finding - Chilaquiles, Thai Spiced Rice Bowls, Make-Ahead Yeast Rolls - timeless sorts of things. She has tips for staying organized and decluttering your equipment and make ahead tips or pairings for nearly every recipe. It's a meal planners dream tool, really, a book to solve weeknight dinner issues. I plan on gifting to a handful of mom friends who just want real food, without the fuss. Not to mention HER HOUSE, which I have envied for years now, but that is a personal problem. Cheers, Melissa, you nailed it. Now, where's my label maker? Harissa is sold usually as more of a spice paste, but you can also purchase it dried. It is sold online, Trader Joes, and most health food stores. Preheat the oven to 450'. Line a baking sheet with parchment and set aside. In a saucepan fitted with a steamer basket, add water to just below the bottom of the basket. Bring to a boil. Add the cauliflower, reduce the heat to medium, cover and steam for 5 minutes. This will begin the cooking process. Transfer the cauliflower to the prepared baking sheet. In a small bowl, stir together the remaining ingredients. 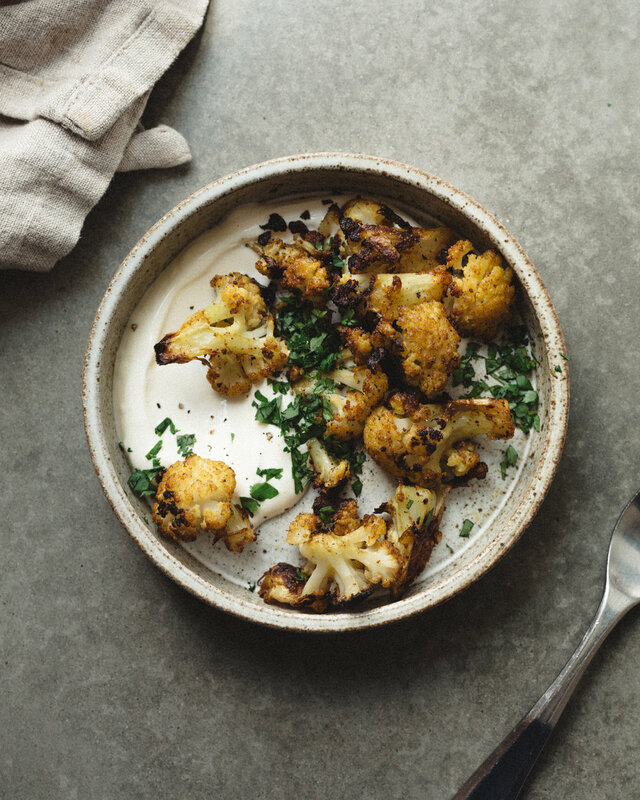 Drizzle over the cauliflower and toss to evenly coat. Bake for 15 minutes. Stir, and bake for another 15 minutes until the cauliflower begins to char on the edges. Taste and sprinkle with salt to finish. We served ours with plain yogurt, and garnished with toasted cashew pieces and cilantro. Here we go, friends. We're towards the end of the parties and big meals and peppermint chocolate goodies and traffic to and from the mall and whipping cream and exhausted looking delivery people. Curran and I are making sandwiches today to set out for them which is probably way overdue because we order a lot of things online. I thought of leaving these delicious fritters but there wasn't a single one left over and I already think the UPS guys isn't sure about us, who knows what judgements I'd be securing in offering him a cold, leftover fritter. Everyone loves a PB+J. I'm also doing some baking for neighbors and family from Anna Jones second book, A Modern Way to Cook. I'm going to try her salted almond butter chocolate bars and carrot cake granola bars that sound just perfect for gifting if I can get them past the hungry hands around here. 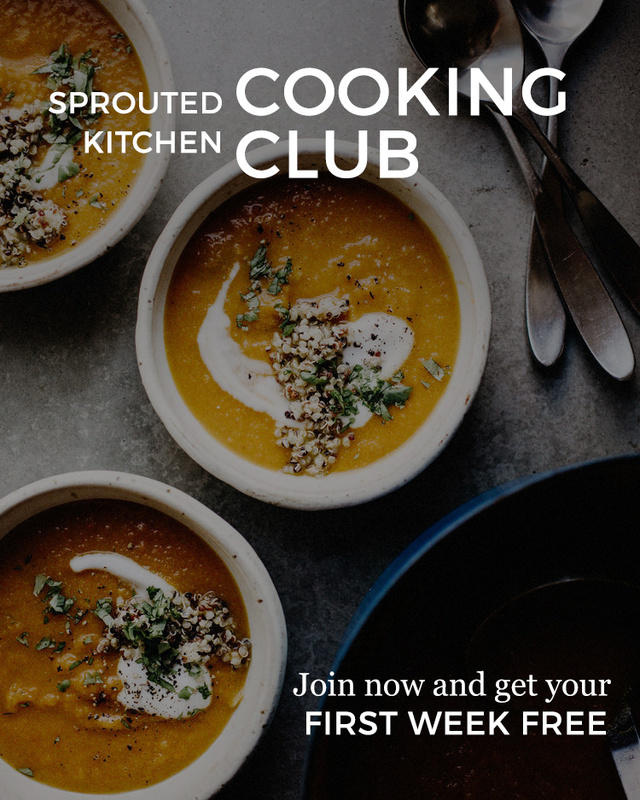 Anna's recipes are wholesome, simple, and creative while the chapters are broken down into 20, 30, 40 minute sections so you can plan meals according to your lifestyle (which timing I suppose is relative to the cook but I think you'll get in the ballpark). She has the kindest way of writing and gives you a confidence that you should just trust yourself. I think that's what I love about English cooks, they don't usually fuss over measurements and I think that's refreshing. Anyway, off to your holiday loveliness but I'm going to leave this delicious little meal right here for you when you need it. It's been a wild year trying to find my feet after adding Cleo to our crew but this space still feels like me. It's tough for Hugh and I to get motivated to shoot a recipe or for me to come up with something to say but I feel like it's important to be here anyway. So thanks for following along and engaging with me here, I think it's pretty special. Wishing you and yours a warm and meaningful holiday with the people you love most. I tried to add a few notes to help below for those that need more specific measurements though I believe this recipe will be forgiving either way as long as there are enough eggs to bind it all. These are gluten free and very delicate so use a gentle hand and patience when flipping - you want to get the spatula completely under them before flipping. If you are short on time, using your favorite hummus or tzatziki would be a great substitute for the yogurt sauce though it just takes a moment. If you are cooking the quinoa, rinse it well, then add it to a pot with 1 3/4 cup water. Bring it to a gentle boil, turn it down to a simmer and cover and cook for 12 minutes until most of the water has been absorbed. In the last few minutes, add the shredded squash on top and let it steam on top to soften but not get mushy. This takes about 5 minutes. Stir it around to fluff and leave the cover ajar for it to cool (This is a great step to do the night before. It cools overnight and makes for quick work of the recipe the following day). Beat the eggs in a large mixing bowl. Add the green onions, greens, oats, cumin, cayenne and a few generous pinches of salt and pepper. Stir to mix. Add the feta, zest of the lemon, the herbs and the cooled quinoa/squash mixture. Mix everything together and set to chill in the fridge while you "get on with another couple jobs" (Anna's line. I love it :). For the sauce, stir together the yogurt, juice of half the lemon, pinch of salt and sumac. Add some finely chopped cilantro and parsley, if you wish. Gather, slice and chop your cucumber, tomato and olives, if using. Toss them in oil and lemon juice if you wish. In a large pan over medium heat, warm a thin layer of olive or grapeseed oil. Remove the quinoa mixture and gently form patties about 3/4" thick and fry them in the oil, about 5 minutes per side until golden brown (I did an extra minute, covered, at the end just to make sure the centers were set).